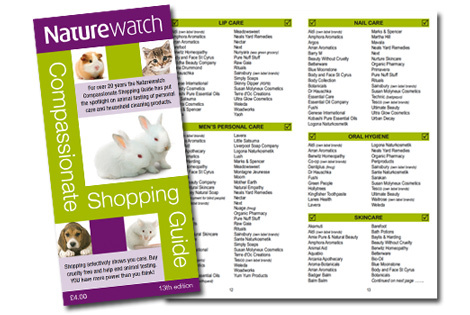 In 1993 Naturewatch lifted the lid on the use of animal testing in the production of personal care and household products by publishing the Compassionate Shopping Guide. Naturewatch was the first organisation in the UK to make this information available to the public, and today the 13th edition continues to highlight why it is so important to understand the policies behind the products. Regardless of the colour of the lipstick, fragrance of perfume or brand of household product, one tag that separates them all is the cruelty-free credentials. Fortunately numerous companies produce outstanding cruelty free products, but just as many refuse to adopt humane testing policies. Despite there being a voluntary ban on the testing of cosmetic ingredients on animals in the UK, testing continues elsewhere in the world, and in Europe alone costs the lives of thousands of animals per year. The 44 page handbag size guide, shows how compassionate shoppers can choose beauty, personal care and household products that have not been tested on animals. It clearly lists which products have been developed using animal testing and also highlights those products and brands which are developed cruelty free. The guide covers most personal and household brands in the UK. Naturewatch only approves companies that have a fixed cut-off date animal testing policy that runs throughout their entire organisation. Therefore, even if a subsidiary company has a policy in place, it cannot be endorsed if the parent company doesn't have a cruelty free policy in place. Whereas some guides may promote cruelty free brands, companies in the Compassionate Shopping Guide have been fully researched to ensure that they support animal welfare throughout their entire range of brands and products. The Compassionate Shopping Guide costs £4.00 including p&p and is available from our web site (» click to view) or by phoning 01242 252871. Shop cruelty free – because the animals are worth it!